RIO DE JANEIRO — “We’ve got them all! 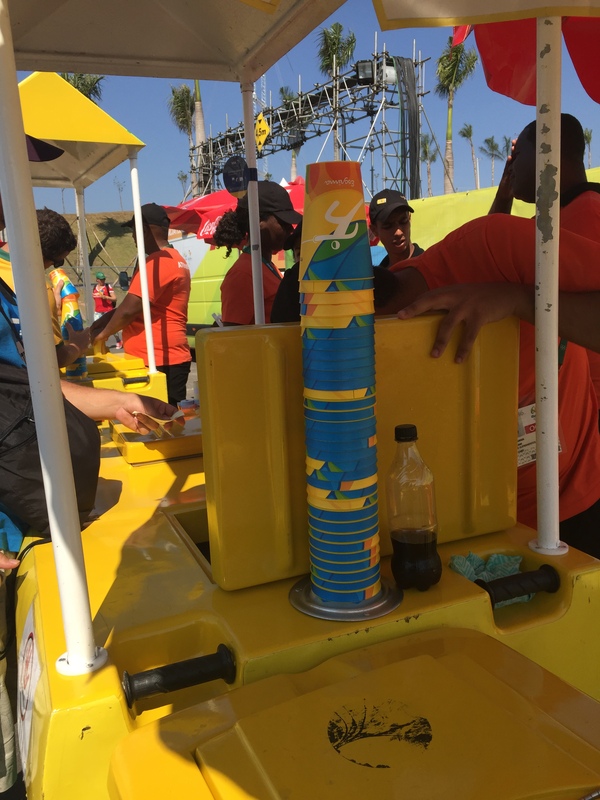 We’re leaving today, and we finally have all 42 of them,” boasted one half of a couple in line for beers at the Olympic BMX Centre, claiming that they’d completed the elusive set of plastic souvenir cups from this year’s Olympics in Rio. I was standing nearby with David Marquardt, a 30-year-old from Utah who said he’d been averaging about seven cups of beer a day and was seeking out the last two cups to complete his family’s set. “They don’t know what they’re talking about,” he joked under his breath. Marquardt’s theory is that there are only 41 variations of the cups — the number of sports listed on the official Rio site (counting each individual equestrian event) — and not the 42 that has been reported widely. 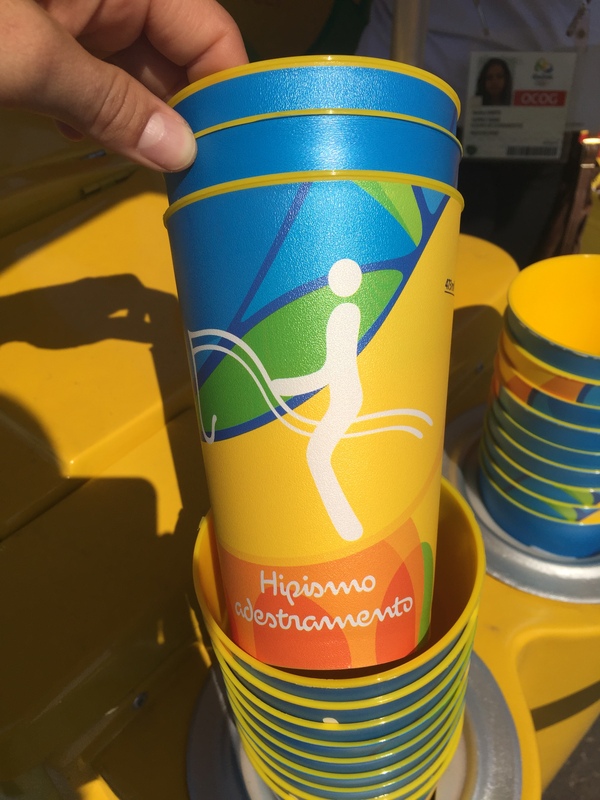 For the past two weeks, people at the Olympics have been losing their minds trying to collect yellow and blue plastic souvenir cups that feature the silhouetted athletes of each sport. 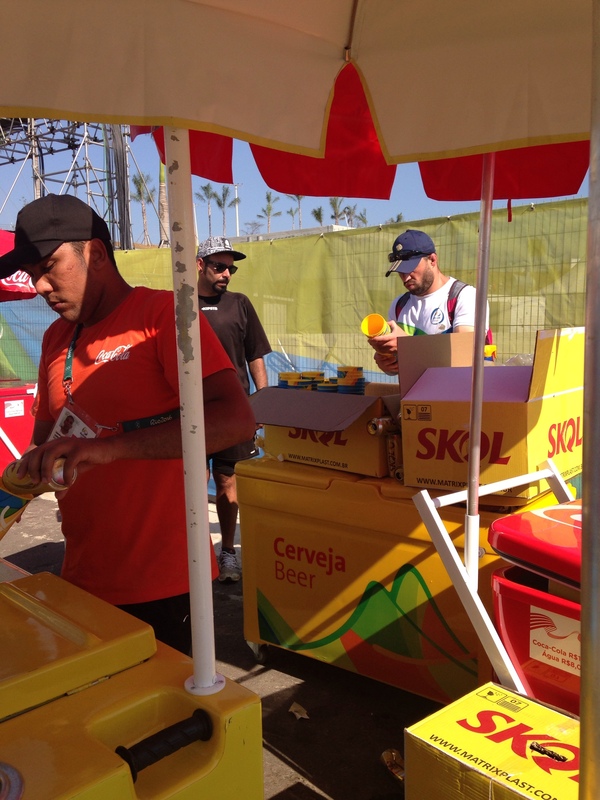 The cups are sold only with the official Olympics beer — Skol — though many collectors are just dumping out the beer or paying full price (13 reais, or about $4) for an empty cup, several vendors confirmed. But although the cups, which are an advertising product for the beer, have been hugely popular, there is little in the way of official information from the company about the collectibles, which has led to the curious situation of visitors trying to complete a set of some indeterminate number. “There are only 41, I am sure, one for every discipline,” said Marcela Rissato, Skol’s operations manager for the Olympics. There was speculation that a 42nd cup might exist for the unofficial gymnastics gala –– the friendly non-medal event in which Olympic gymnasts strip-tease or dance in wigs — or that maybe there were two cups for wrestling, one for Greco-Roman and one for freestyle. The confusion comes in part because no official marketing materials were released by Ambev, the South American distributor of Skol, stating the number of cups or how best to collect them. But the mystery has only fueled fascination, making the frenzy around the cups more happy accident than calculated guerrilla marketing. “I think we are bigger with the cups than the pins, compared to the other Olympic games,” said Rissato, referring to the more traditional on-site collectible. She did say, however, that Skol is attempting to crack down on any vendors selling the cups — which at their core are ad space — without any of the beer they’re advertising. “That is against the rules; every cup must come with beer,” Rissato said. Their success at that has been questionable. The yellow cerveja stands at every venue have been unusually packed, but not because people are clamoring for the Bud Light of South America. There are two lines at the stands — the first to pay and the second to collect your beer after selecting your cup — and each person takes about five minutes to sort through the stack of randomly sorted cups in search of certain sports. Most vendors look exasperated — JUST PICK A CUP ALREADY — while others have been angered as crazed cuppers rummage through the supply boxes behind their stands. Tracking down a complete set shouldn’t be impossible. Each sport’s cup was manufactured in equal number, Rissato said, but Skol doesn’t know how many cups exist in total, let alone where to find each kind. So what becomes of the collectibles once they’re back home? A Canadian couple from Alberta holding a stack of about 20 cups told me that they planned to use them for beer pong, which seems a lot more reasonable than displaying 41 yellow cups across your mantel. As for Marquardt and his family, they weren’t totally sure what they’d do with their collection. “We thought maybe this would be an ‘Antiques Roadshow’-type situation, where if you have a full set, the value multiplies tenfold,” he said. “But we’ll probably just use them as party cups.” For now, they’re displaying their complete set at Flamengo beach.